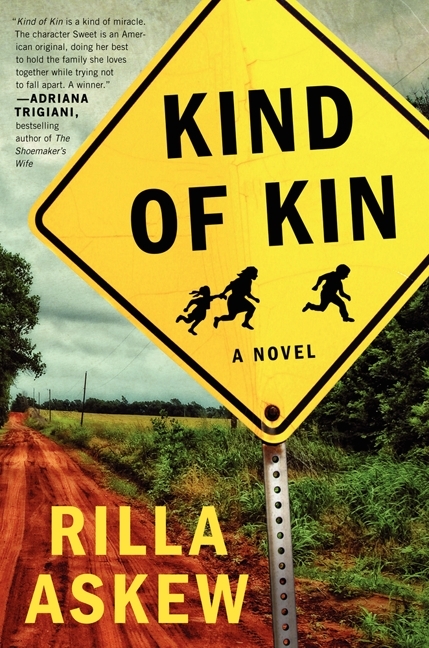 I recently reviewed Oklahoma-based writer Rilla Askew’s powerful 2013 novel, Kind of Kin, on the publication of the paperback version (since the hardcover came out in Jan. 2013, before this blog existed). http://wp.me/p3EtWm-80 I had the opportunity to speak with her several times recently and we finally managed to have a conversation “on the record” for Read Her Like an Open Book. She is so smart, so articulate, so passionate, and so down-to-earth that I both respect her immensely and like her a hell of a lot. She’s good people, the best that Oklahoma has to offer. As you read her responses, you will see that she is a natural — and gifted — storyteller, an explainer par excellence. While this might be the longest interview I’ve posted, I think it reads the fastest because Rilla is a compelling writer and speaker. You just have to listen to her. If you haven’t read Kind of Kin, I encourage you to do so in the strongest possible terms. It is an important book that doesn’t fall prey to the polemical indulgences and heavy-handedness of most serious, contemporary issue-oriented novels. It is first and foremost a terrific story, well-told. We discussed the influence of Oklahoma on her writing, the inspiration for Kind of Kin and the process of writing it, her reading life and the authors who have inspired and influenced her, and the growth of book clubs, author appearances, and social media and their impact on writers and publishing. You were born and raised in Oklahoma and still live there. It seems to be in your heart and soul and thus in all your writing (as Mississippi was with Faulkner). What about your home state speaks to you and demands that you tells its stories? In my heart and soul, yes. That’s a perfect way to put it. The pull of Oklahoma is so powerful to me—the harshness and beauty of the landscape; the fierce wind, sky, weather; its complex, violent, and paradoxical history; and the disparate cultures that have come together here all make for an inexhaustible source. Like Faulkner and his little postage stamp of native soil, I’ll never exhaust it. I moved to New York thirty years ago, and my husband and I still divide our time between Oklahoma and the Catskill Mountains in upstate New York, but Oklahoma is always “home” in the truest gut-level sense. In particular it is Oklahoma’s race history that grips me. I see the state’s narrative as a microcosm of the larger American story, distilled, transmogrified into a more intense, compelling, and in some ways grotesque version of itself. From the tragedy of the Trail of Tears, when Native peoples were forced here from their homelands in the 1830s, to the dramatic Land Runs of the 1880s, to the great oil boom and Tulsa Race Riot of the early 1920s to the mass exodus of poor whites during the Great Depression, Oklahoma’s story, like America’s, has been one of migration, restlessness, land hunger, violence, decency, deception, faith. It’s also the story of the coming together of America’s three founding races, Black, White, and Indian, and the resulting clash and cohesion of that narrative underpins all my work. What motivated you to take on the issue of illegal immigration in Kind of Kin? Were you writing out of anger, frustration, disappointment, or some other emotion(s)? These same themes, Oklahoma as microcosm, have continued into the twenty-first century as the state’s Hispanic population grew. In 2007 the Oklahoma legislature passed what was then the harshest anti-illegal immigration law in the nation. (This was three years before Arizona passed their SB 1070 that received so much national attention.) I’d written Fire in Beulah about the Tulsa Race Riot, and I knew well that it was not just individual racism and prejudice that led to that horrific conflagration, when some 10,000 whites stormed into the Black section of Tulsa and burned it to the ground, killing an untold number of people, though the best guess is around 300. It was also legislation, laws passed by the state, that targeted a specific group—specifically the laws of racial segregation which were the very first laws passed by Oklahoma’s new legislature as soon as it became a state. The racial prejudice carried into Indian Territory by white southerners was encoded into law by Oklahoma lawmakers. And this new immigration law, HB 1804, was designed to target Hispanics, there’s really no other way to interpret it, and indeed there was a great exodus of Hispanics from the state soon after it went into effect because of the climate of fear the law produced. Then too, I was raised strongly Southern Baptist in Oklahoma and know well how the dominant culture here considers itself Christian. This is especially true of many state lawmakers. Yet they had passed with large majorities in both houses this law that could and would target families and individuals. The law made it a felony to harbor or transport undocumented immigrants—essentially made it a felony to be our brother’s keeper, to be a good Samaritan, to do the things that Jesus taught. Irony is not even quite a sufficient word for that. And finally, my niece was married to an undocumented Mexican man who got stopped by Tulsa police for a driving infraction, was held for immigration, and deported. I saw personally what happens to children when their daddy is there one day and vanished the next, what happens to spouses, to families. So I had a sociopolitical worldview, a spiritual worldview, and a personal family experience, all of which forged my opinion of the law itself. I hadn’t thought I’d write a novel about it, though. I just thought somebody should. I kept saying to friends: you should write about this. Somebody should write about this. And the work unfolded from there. I was particularly impressed by the seamless way you wove a contentious social, political, and economic issue into a complex and compelling family drama. The story never turns into a polemic; the focus is always on the very human characters and their dilemmas. As a writer with a strong socio-political bent, how do you combine the two strands? One of my favorite novels is Richard Wright’s Native Son. In the early part of the novel, where we stay with Bigger’s story, live his fear and rage, his powerlessness and violence, the myriad ways he is buffeted and stressed by America’s race history, I’m moved as a reader, and I understand on the powerful, experiential level that fiction affords much more than I can articulate, not only about Bigger himself , through Bigger, and it’s in this way, that, as Flannery O’Connor said, the best stories resist paraphrase. But in the later chapters, when the novel becomes a mouthpiece for Wright’s political views, the fiction fails. As a reader, I lose interest. The human story is diminished, Wright’s ideas take precedence, and the book devolves into a polemic. This could be said of some of the other great writers of that era as well, and because I do hold strong political and peace-and-justice views, I’ve tried to watch out for that in my work. I wanted to speak to the fact that immigration is a deeply complicated issue, with no simple solution, but no doubt my personal feelings bleed through. Still, I tried not to make it a polemic, and the book certainly doesn’t purport to offer any answers. It simply says that human beings are affected, families are affected, little children are affected by laws that lawmakers make. Can you describe your writing process, from the genesis of the book’s theme or concept through writing and revising? Who, if anyone, reads your earlier drafts? Do you belong to a writers’ group? A novel for me always begins with the ‘thing’ I want to write about: Oklahoma’s immigration law in Kind of Kin, the Tulsa Race Riot in Fire in Beulah, the dispossessed and downtrodden during the Great Depression in Harpsong. Usually the thing I want to write about also determines place and era. Next come the characters whose story I’m going to tell. Then I start researching and drafting the novel. I go to the library in whatever place I’m writing about and look at microfilm files of newspapers and periodicals for the period. A lot of the details of everyday life in Harpsong came from my parents, who grew up during the 1930’s. I’ve been listening to their stories of the Depression all my life! I drive around the landscapes I’m writing about. I buy books and books and books related to the subject and time and place, and I immerse myself in all kinds of things—politics of the era, newspaper ads showing what they wore and how much they paid for bread or washing powder. For Kind of Kin I spent a lot of time at the capitol in Oklahoma City learning how the Oklahoma legislature works. Sometimes the research itself leads me to story elements, and sometimes what I’m writing in the story tells me what I need to research and find out about. It takes me a long time to draft a novel, and I do an incredible amount of revising as I go along. I wish I could write a looser first draft and then go back to revise the whole thing, but the fact is, if I’m not happy with the language on a sentence by sentence level, I can’t go forward. I just have to keep honing and shaping the language to make it right. Thus it takes me three to five years to write a novel. I have four primary readers. My husband Paul Austin reads the work as I’m drafting it. Often I’ll show him pages or even paragraphs as they’re finished, and he gives me excellent feedback, especially in terms of dramaturgy and character motivation, because he’s an actor and director and all-around man of the theatre, so he knows well how conflict and rising action and climax and character intentions work. My sister Ruth Brelsford reads passages in larger chunks, but still in early draft forms. She doesn’t give me feedback but serves as that reader out there waiting to hear the story, waiting to find out what happens next. She helps me keep the narrative moving. When I have a completed or nearly completed draft I share it with my friends Constance Squires and Steve Garrison in Edmond, Oklahoma. They’re fiction writers, teachers of writing, and long, long time friends. They both have such deep knowledge of how fiction works and a keen sense of my work, my intentions, and they also know Oklahoma well and true. The four of us exchange work on an ongoing basis, Connie and Steve and Paul and me. My husband is a writer, too—primarily of plays, poems, and essays. We work together as a foursome, sitting around the living room, three of us giving feedback to the fourth on a full draft of a novel or play or story. We’ve been doing this for over a decade. It’s the closest thing to a writing group I have. What did you think when Odyssey Bookshop in Massachusetts selected Kind of Kin as its First Edition Club book for January 2013? (That is how I discovered the book immediately after its publication.) What was that experience like? How do you like author appearances and book signings generally? Most novelists know about Odyssey’s First Edition Club, but I’d had a bit of firsthand knowledge of that wonderful independent bookstore, too, from when I taught at the University of Massachusetts Amherst in 2001. Although Amherst has some of the best bookstores around, I still drove over to South Hadley when I could just to enjoy the atmosphere at Odyssey and peruse the shelves. So it felt like a very special honor when I learned that Kin had been selected for the First Edition Book Club. It was a delight to travel there from Oklahoma and sign so many copies that I knew would go out in the world to unknown places (like Bakersfield!) and unknown readers (like Bill Wolfe!). It was also a pleasure to meet readers, listeners, who came out on a snowy frigid night in January to hear me read. At least one writer who came that night has become a Facebook friend, and we saw each other recently at the AWP conference in Seattle. I always have a good time at author appearances and signings, whether the gathering is small or large. I enjoy reading for audiences because it satisfies the old actor in me, but above all, I like meeting with readers. You know we work in such solitude, and we send the story out there without knowing how it’s received, a message in a bottle. Yes, we do get to know what some readers think through Amazon or Goodreads reviews, but many readers do what I do with a book—simply read and savor and experience and never contact the author to say, “This meant something to me.” So I’m especially grateful for readers like you who not only read and savor but write about and share. I really love the opportunities I’ve had to talk with readers—whether at signing events or meeting with book groups. It’s a delight to me to engage with that third party in the magic of fiction, to talk with the great imaginer, our partner in this endeavor: the reader. There’s first the author and second the characters, and third and most-important, the reader, without whom the writer and characters are nothing. I’m very aware that the full life of the work happens precisely one reader at a time. If I’m doing my job right, the reader feels engaged not with me but with the characters, that lived life of the mind, the imagination. When I get to meet someone who says, “This story meant something to me, these characters engaged me,” I’m moved and happy. 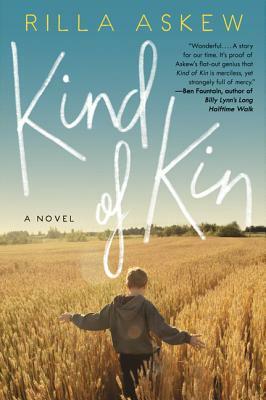 Are there any plans to turn Kind of Kin into a movie? It seems very cinematic to me. And there are certainly a lot of great roles in it that would be perfect for a strong ensemble cast. I could see Alexander Payne doing a nice, understated job bringing it to the big screen (rather than having someone with more commercial sensibilities turn it into a melodrama). Ah, I wish, I wish. More than one reader has commented on the cinematic nature of both Kind of Kin and Fire in Beulah, but I’ve not had any filmmakers approach me yet. Your idea about Alexander Payne is a terrific one. I’d love to see what he would do with Kind of Kin. What is your take on the recent gender equity issues in publishing and media coverage of literature? How can we get more men to read fiction by women? These are good questions, and I’d like to have some helpful thoughts to offer, but alas, I don’t. I recognize that there is gender bias, and I’m sure I’ve been on the receiving end of it from time to time (there are some reviewers, in particular, I could name), but it’s not something I spend a lot of energy on—largely, I think, because I hardly have enough time and energy to get my own work done. This is one reason I’m so grateful to people like you who do pay attention, and who declare, as you do with your blog and other articles, that women writers are worthy to be read! The fact is, I think one of the best ways to get men to read more fiction by women is exactly what you do on a daily basis, which is read and review it, and also to point out how much they don’t. Has the tremendous growth of book groups and book blogs had an impact on your book sales or your experience as an author who is “out of the spotlight” in Oklahoma? I’ve had delightful experiences with book groups. I visit them every chance I get, whether in person or by Skype or by answering their questions via email. Whether the growth of book groups and book blogs has had an impact on sales for me, though, I really don’t know. This is another one of those areas I probably should pay more attention to but don’t. All I know is that I enjoy book clubs tremendously when I get the chance to join them, and that your blog, in particular, has been a great boon to my spirits. I guess sales results remain to be seen. What authors have had the greatest impact on you as a reader and/or writer? Why? What classic or favorite novel would you like to put in every reader’s hands? In the beginning it was the great Southern white writers who most influenced me—Faulkner, as you may have surmised, and Flannery O’Connor and Carson McCullers. The next wave of influence was the powerful mid-century African-American writers whose work changed America itself, American letters, and, once I began to read them, my entire understanding of the world: Richard Wright, yes, and that great Oklahoma-bred author Ralph Ellison, and most significant for me, James Baldwin. A number of American Indian writers have also had a profound influence on me, especially Joy Harjo, Joe Dale Tate Nevaquaya, and Sherman Alexie. What have you read in the last year or so that really made an impression on you? Who deserves more attention? Are there any “young” writers you’re especially impressed by? Ben Fountain’s fabulous collection of short fiction Close Encounters With Che Guevara stunned me with its force, its fierce intelligence, its powerful reminder that the U.S. is not the center of the world. I was captivated by Louise Erdrich’s The Round House—for me, it was the kind of reading experience where the characters stay resonating with me all day as I go about my ordinary life, and I can’t wait to get back to them when it’s time to go to bed and read at night. Two books that came out in 2013 that I completely loved, that are written by friends of mine, and that, though they have received good attention, deserve even more of the world’s notice are Man Alive! by Mary Kay Zuravleff and The Virgins by Pamela Erens. Though they are very different novels (the former being about a child psychiatrist being struck by lightning and the latter a novel about a transgressive love affair in an elite boarding school), they share a wicked, knowing, language-drenched intelligence that makes me savor every sentence even as I’m carried along with these complex characters in a story that keeps me wanting to know what happens next. I encourage your readers to check these writers out! I would also encourage readers to check out the writer Constance Squires. Her first novel Along the Watchtower came out in 2011, a wonderful coming of age story about an ‘army brat’ growing up in Germany and Oklahoma, and her short fiction appears regularly in a variety of journals. She’s a friend of mine, yes, but she’s also a writer to watch! What are you working on now? Do you write short stories or essays while you’re working on a novel? What do you like about both the long and short forms? Will you try the YA market like so many other authors have in recent years? I have two novels brewing, but just now they are both on a back burner, and they’re both so nascent that I’m hesitant to talk much about them, except to say that one is set in the Cherokee Nation around Tahlequah, Oklahoma, during the 1970’s, and the other is set in Tudor England during the reign of Henry VIII—a bit of range there. I don’t in fact know if either of them will turn out to be the next novel, in terms of what comes out next. Some other story may nudge its way to the fore, as Kind of Kin did. I can’t work on other things while I’m at work on a novel. I’m a slow writer and I need full immersion in the era and characters and material of the longer works, so I just have to stay with it. But because I’m teaching just now and doing lots of travel, I’m not ready to go into the deep immersion a novel requires, so I’ve been working on shorter pieces—primarily nonfiction. I’ve had a couple of essays appear in recent months, one about rattlesnakes in Tin House and one about tornadoes in TriQuarterly. Good ol’ Oklahoma subjects. I’ve just finished a piece on racial profiling, ways I’ve seen that phenomenon play out in my godson’s family, which I hope will appear somewhere before long. By instinct and habit and reading passions, I’m most essentially a novelist, but I do like writing essays. I haven’t tried my hand at stories much in recent years, although that’s where I began as a writer, and my first book, Strange Business, was a collection of short stories. I have trouble narrowing my focus to the sharp focus short fiction requires, have difficulty making it about this moment in a character’s life, this distilled essence. I always want to make it about too many things. I admire the masters of short fiction and love to read them, but it’s not a natural fit for me. My latest story, “Ritual,” published in a recent issue of St. Katherine’s Review, came in at 10,000 words—that’s pretty long for a short story. I doubt I’ll try the Young Adult market, though I’d never say never about anything having to do with writing. But I seldom read YA books, don’t think I have a natural feel for it—though the YA lovers in my life, my goddaughters and nieces and nephews, keep me apprised of what’s happening. You never know. What is your daily routine, both in terms of writing and your “regular” life? 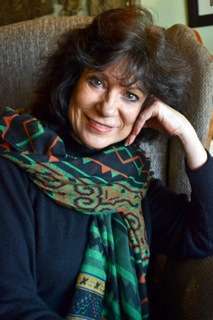 In other words, what’s a day in the life of Rilla Askew like? What are your non-writing interests and activities? Just now I’m teaching at the University of Arkansas and am traveling a lot between Fayetteville and southeastern Oklahoma, where Paul and I have a home and my parents live. With so much driving and teaching, that’s about all I’m doing just now. But the semester will be finished in May and we’ll return to the Catskills, where Paul operates the Liberty Free Theatre. I’ll get back in the writing groove, and frankly, when I’m working on a book, that’s about all I do. As someone (Jane Austen? Virginia Woolf?) once said: “A writer wants an uneventful life.” Has to be so, at least for me, otherwise I have no space in my head for the work. So the simplest answer to ‘What’s a day in the life like?’ is this: not much. I try to get up very early to write, and I stay with it as long as I can (I’ll have to give myself a self-imposed timeout from Facebook come May! ), and when the day’s work is finished, I walk two miles on our country road. If Paul has a play running, I’ll go see that in the evening, or visit with friends, or read. When I’m doing research for a novel, much of my reading is not for pleasure but really directed toward the work. We don’t have regular television but do have Netflix via the internet so sometimes I’ll watch shows in the evening, but I know I do better to read. That’s it, that’s the rhythm: rise early, write, walk, read. Oh, and eat, of course, and do laundry, and all the ordinary things, but it probably looks pretty boring from the outside. The routine is interspersed with trips to Brooklyn to see my godchildren or into Manhattan to see plays or go to readings or trips to Oklahoma to see family and friends. A good life, if unglamorous—or anyhow, it suits me.